Does fudge in specialty shops tempt you? Even though making fudge is easy, I still swoon salivate get excited at the thought of fudge, especially chocolate fudge. Occasionally, I give in, and more than once I have been disappointed. 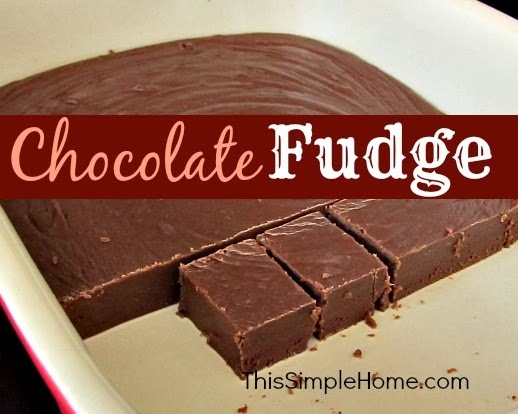 My favorite chocolate fudge recipe is based on the recipe for fudge from Fluff. I'm not sure when I adjusted it, but it doesn't quite match the one on their site. This chocolate fudge recipe does not require a candy thermometer. Just remember to set your timer and stir constantly, and you can't go wrong. 1. Butter an 11x7* pan. 2. Combine sugar, evaporated milk, butter, creme, and salt in a large sauce pan. Stir over LOW heat until blended. Once combined, bring to boil over MEDIUM heat; being careful not to mistake air bubbles for boiling. Then boil slowly, STIR CONSTANTLY for 5 minutes. 3. Remove from heat. Stir in chocolate and vanilla until melted. Pour into buttered pan. Spread to the corners. 4. Wait patiently for the chocolate fudge to cool and then slice with a sharp knife. Store covered at room temperature. *You may use a 9x9 or 9x13 pan. I prefer larger pans so that the fudge spreads out more. Because really, I'm going to cut the pieces into 1x1 pieces despite the thickness. It's best to make chocolate fudge when you are expecting company or sharing as a gift. Otherwise, put fudge out of sight if you lack a bit of self-control. I keep my chocolate fudge on top of the refrigerator...otherwise I take a little bite every time I walk by...and I might walk by just to see how much fudge is left in the pan. How do you feel about walnuts in fudge? I leave them out since my husband dislikes them. The first time we had this recipe, it was as a gift and included walnuts. When my husband still loved the fudge, I knew the recipe was a keeper since he dislikes nuts in foods. Be sure to check out my other recipes. I prefer simple and easy recipes. I love nuts in fudge! I need something crunchy to offset the softness of fudge (or ice cream, chocolate bars, etc). Not a marshmallow creme fan though.